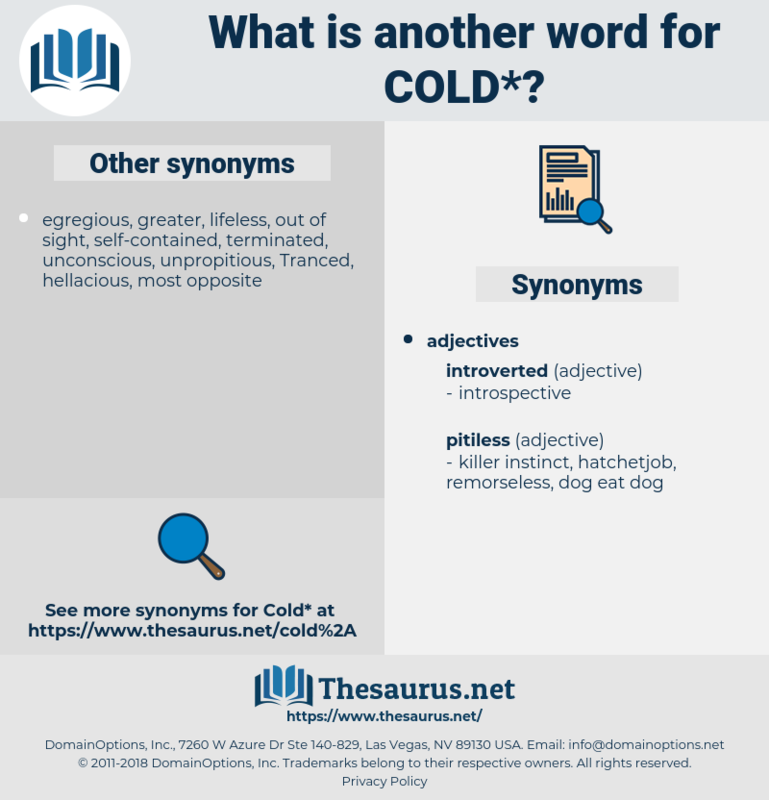 What is another word for cold? The sensation or feeling produced by the want or loss of heat; a disease contracted from improper exposure of the person to atmospheric changes; a shivering or chilliness. iced, cold-chain, glacial, low-temperature, lukewarm, refrigerant, insensitive, harsh. 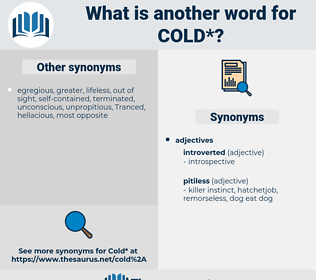 cold-rolled, cool, cold-storage, cold-war, cold-blooded, freezing, cold-water, indifferent. cool, freezing, coldwater, lurch, refrigeration. good, eager, ignorant, excited, heated, ardent, enthusiastic, blunt, kind, warm, friendly, dull, nice, mild, interested, zealous, sympathetic, fervid, stupid, temperate, animated, responsive, pleasant. active, up, bright, expansive, agreeable, buoyant, sunshiny, vibrant, red hot, lively, dynamic, communicative, running, awake, seething, near, hospitable, close, canicular, happy, lighthearted, thriving, kindhearted, inflamed, flushed, imperfect, garrulous, jolly, amiable, cheery, expressive, folksy, functioning, humane, cheerful, steamy, joyful, gracious, revived, original, summery, joyous, operative, going, vivacious, jocund, lightsome, resuscitated, snug, alert, molten, talkative, congenial, quick, fresh, merry, muggy, optimistic, blithe, compassionate, nigh, equatorial, vital, blithesome, reheated, mirthful, hopeful, festive. Are you cold, dear one? respiratory disease, communicable disease, respiratory illness, respiratory disorder.